Immigrants’ rights groups sued the government Sept. 17 over a backlog in processing citizenship applications that has left more than 753,000 people waiting to access lawful citizenship and voting rights. The lawsuit stems from failure by U.S. Citizenship and Immigration Services, the agency that process and adjudicates naturalized citizenship, to provide documents requested through the Freedom of Information Act that the groups hope will shed light on practices they say are intentionally creating the backlog. In Arizona, there are 14,641 naturalization applications pending as of March 31, according to the latest data from USCIS. That’s more than double the number of pending applications on the same date in 2016, when the backlog was 7,105. USCIS said there’s been a historic influx in citizenship applications. In the last two fiscal years, there was an average increase of 25 percent in the number of naturalization applications nationally, according to an agency press release. USCIS spokesman Michael Bars said in a statement the agency is processing citizenship forms “more efficiently and effectively” and expects to complete more than 829,000 applications by the end of this fiscal year — up from more than 715,000 last fiscal year. Nelly Gonzalez, who moved to Phoenix 12 years ago from Venezuela, said she sent her naturalization application about three months ago. Gonzalez took civics class and learned more about the application process through the LIBRE Initiative, the Hispanic outreach arm of the conservative Koch network. The process to obtain U.S. citizenship starts with submitting an application and paying a $725 fee, getting fingerprinted. That is followed by an interview to test the applicant’s civics knowledge and proficiency writing, reading, and speaking English. 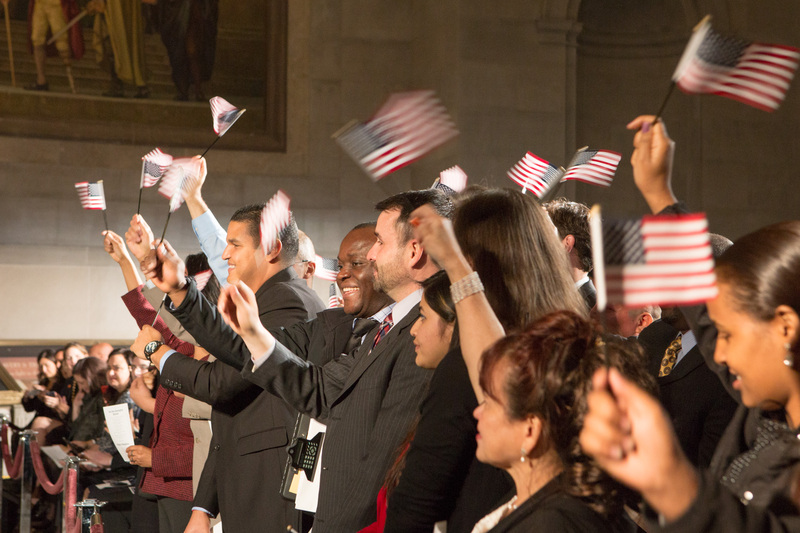 The naturalization process culminates with an oath of allegiance to the United States. Voter registration groups are usually present at those events. Gonzalez, who works as a graphic designer, said she is eager to vote and engage civically. Because of the backlog, she might have to wait until November 2019 to register to vote. In Phoenix, USCIS estimates processing for naturalization will take between 14.5 months and 17 months. In Tucson, the estimated wait time is 9.5 months to 18 months. Jose Vazquez, chair of the Arizona chapter of the American Immigration Lawyers Association, said the naturalization process would take between four to six months as recently as 2017. This backlog has a “chilling effect” on both current and prospective naturalization applicants, he said. The groups that sued USCIS consider the backlog a form of voter suppression and call it a “second wall” — one that prevents immigrants eligible for naturalization access to lawful citizenship and voting rights. Gonzalez said she was surprised when she learned the naturalization process will take over a year. She can’t leave the country, which means she’ll miss out on training seminars her employer holds in Mexico. And she can’t visit home, which is the hardest part, she said. “My family needs me. They need basic things like shampoo, hygiene products, medicines. I need to give them money. It’s a sad situation. The Venezuelan people have a lot of necessities,” Gonzalez said. Sending money through banks is restricted and mailing packages is unreliable and more expensive than traveling there, she said. Despite the backlog, many local groups encourage and educate eligible immigrants to apply for citizenship. Since 2017, Mi Familia Vota has held a dozen workshops in Phoenix and Tucson and helped about 1,200 people apply for naturalization, according Anakarina Rodriguez, state field director for the group, which promotes voter registration and engagement. Mi Familia Vota is one of the nine organizations that sued USCIS. The other groups include the National Partnership for New Americans, a coalition with presence in 31 states, and UnidosUS, formerly known as the National Council of La Raza. Rodriguez said there was an increased interest in applying for citizenship after the 2016 presidential election, as President Donald Trump vowed to change immigration policy. Nationally, groups organized a push to get eligible immigrants to naturalize. Immigrants are eligible to naturalize after five years of possessing a green card, or three years if married to a U.S. citizen. Green cards, which grant work permits and access to some federal benefits, are only available to immigrants who hold certain types of visas, have resided continuously in the country for several years, and are in good standing with the law, among other requirements. Green card holders are officially known as legal permanent residents. Rodriguez, from Mi Familia Vota, questioned the fairness of the backlog in citizenship applications. “To what extent are people being treated legally and fairly if the system is failing?” she said. In Arizona, 43 percent of the state’s 934,883 foreign-born residents are U.S. citizens, according to the Migration Policy Institute. Last week, 70 immigrants joined that statistic during two naturalization ceremonies held in Phoenix and outside Tubac, in Santa Cruz County. The newly minted Americans hailed from 35 countries including Bhutan, Egypt, France, Israel, Iran, Mexico, Nigeria, Romania and Japan, said USCIS spokeswoman Maria Elena Upson.